Your CD rood directory should look like this. 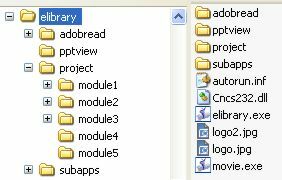 The elibrary, autorun, project, subapps and cncs232.dll(may be hidden) files are always required, the others may be required. There is only one Root Directory which must contain the elibrary.exe program and first contents list and description text files. This level only must also contain a few other additional files that are not required in the other directories. Some of these files can still be edited in the same way you have edited the other files but they will often apply to the complete program, not just this directory. Cnc232.dll (This is a very important system file, however, you may not be able to see this with some computer set-ups as it may be a hidden file. In Windows Explorer go to Tools/Options/view/ and select display all hidden files. Plus all of your text files, directories and media files you have included. Once you have completed your program on your computers hard drive you should be able to test it fully by making sure every section is present and operational. When you are happy with the program content you can then copy the whole program onto a CD. This should be a very simple operation with any CD writer but read your CDRs user manual if you have any problems. If you maintain the same structure as you had on you hard drive then the program will operate in the same way. You can include an autorun.inf file to make the program run automatically when the CD is placed in most CD drives.